This post brought to you by The Hershey Company. The content and opinions expressed below are that of https://LollyJane.com. 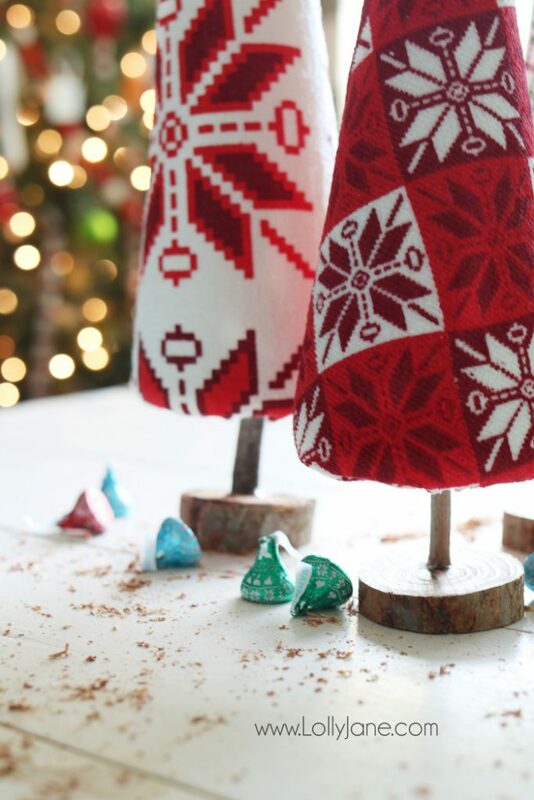 While shopping Walmart, we spied the cutest Hershey’s Kisses Kissmas Sweater Chocolates, which reminded us of these cute sweater trees we pinned last week. 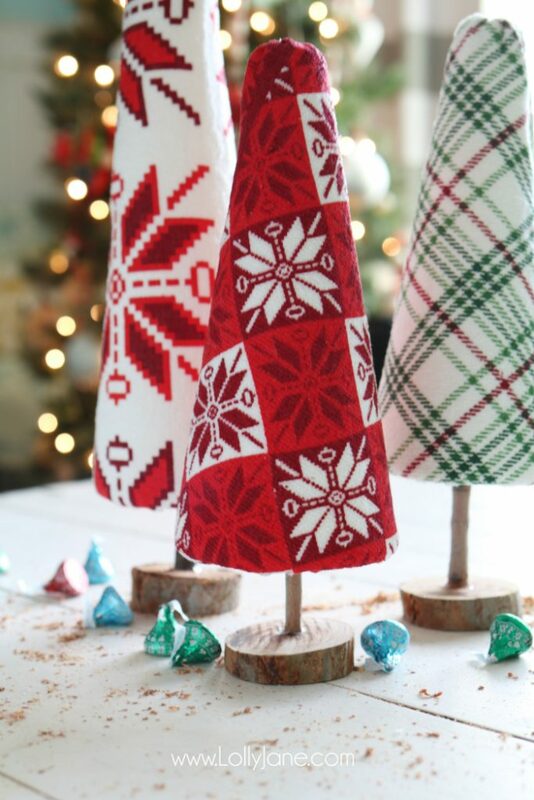 Those inspired us to make these DIY Ugly Sweater Trees craft, the perfect centerpiece for the holiday season. Aren’t they so darn cute?? 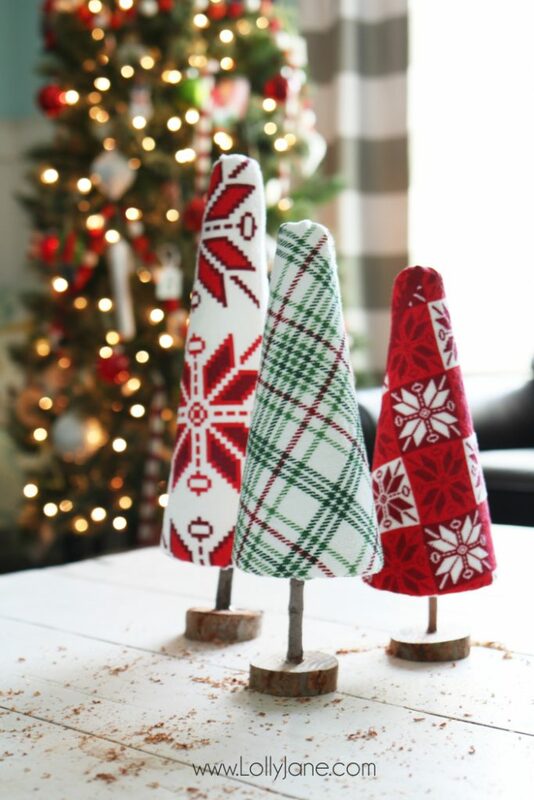 They are the perfect craft to celebrate the holiday season! Guess what we used for the pattern?? I was going to use some crazy socks but when I found a pair that would work pattern-wise, I realized the heel would mess it up…plus they were $3/each so I would need to buy 3 pairs so each tree had its own pattern. 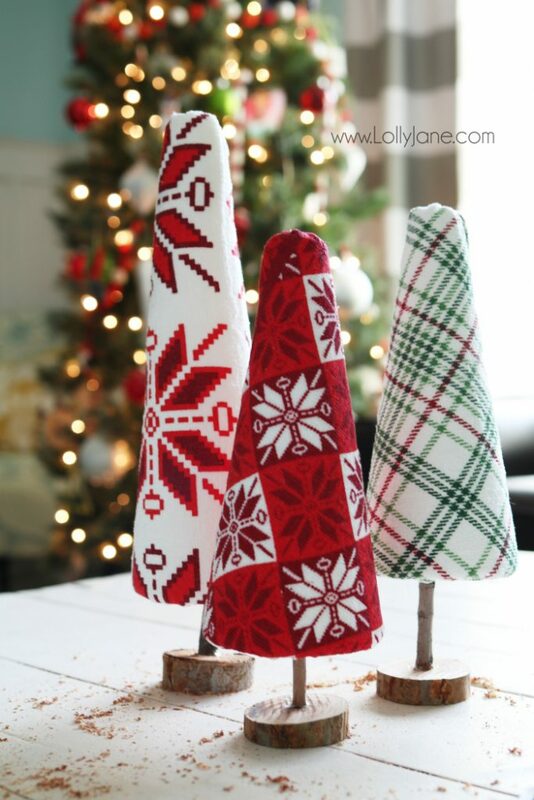 I was going to venture to the fabric section but spotted these Christmas hand towels at Walmart for $0.88/each!! I visited the craft section and grabbed these foam cones in 2 different sizes, one large and two medium. I knew I could vary the height by making my bases different heights. 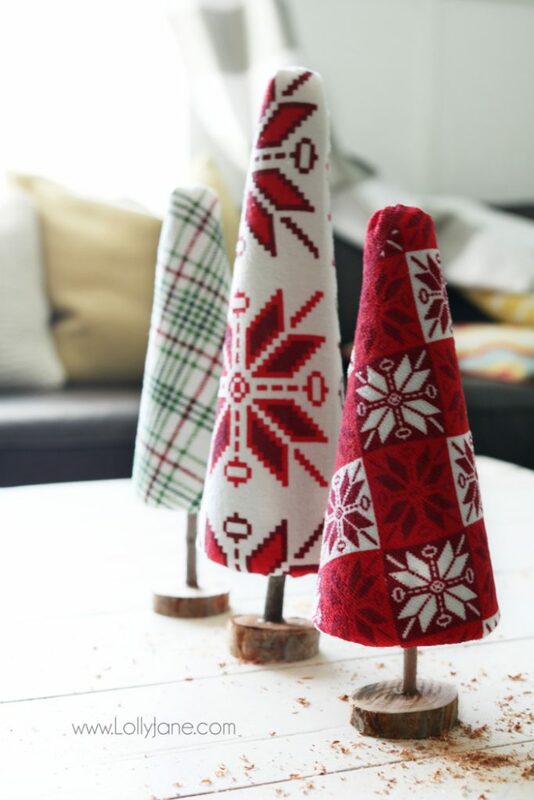 To make your own Ugly Sweater Trees, you’ll need a few basic supplies. 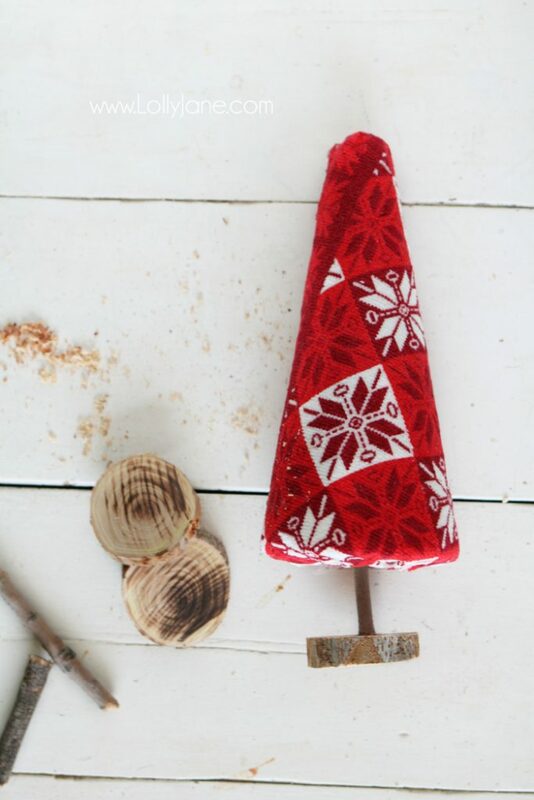 Gather coordinating patterns, cones, Hershey Kisses Kissmas Sweater Chocolates for snacking plus some fabric scissors and hot glue gun**. I used 2 sticks of hot glue total. (**Disclaimer: Please exercise caution when using hot glue guns. Completed craft is for decorative purposes only, please do not eat candy included in the craft). We cut the towel down by 1/3 in size, dotted one edge with hot glue then wrapped it around the cone. Hot glue shut then trim the excess. It’s a very easy process, just pull tight as you go to prevent wrinkles. For the tops, we simply folded the fabric in and layered glue to seal it. For the bottoms, just hot glue the fabric in and fold along the underside. 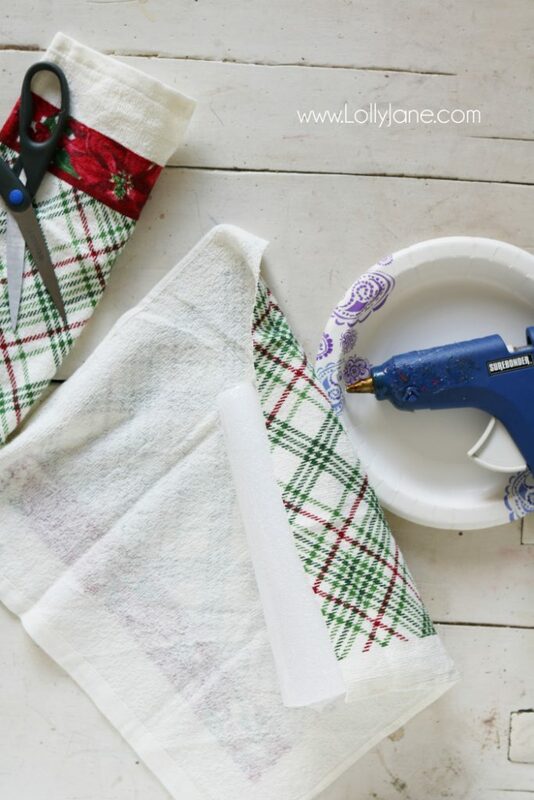 You can add a circle piece of fabric to the middle to finish it off if you’re going to set these directly on your table or shelf. We left ours open for our wood slice base. To create our rustic base, we upcycled from our yard! Kristi’s trees fell over in a storm last month and instead of throwing the dying tree away, she saved the branches for decor. 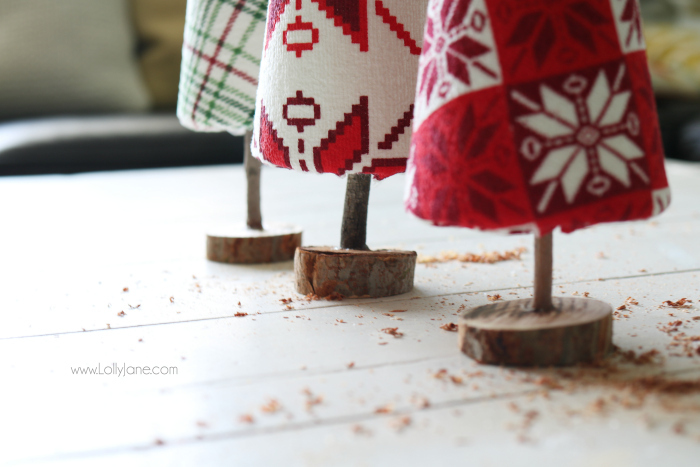 I borrowed a branch from her basket then used my miter saw to cut 3 slices off a skinnier brach for each little tree base. 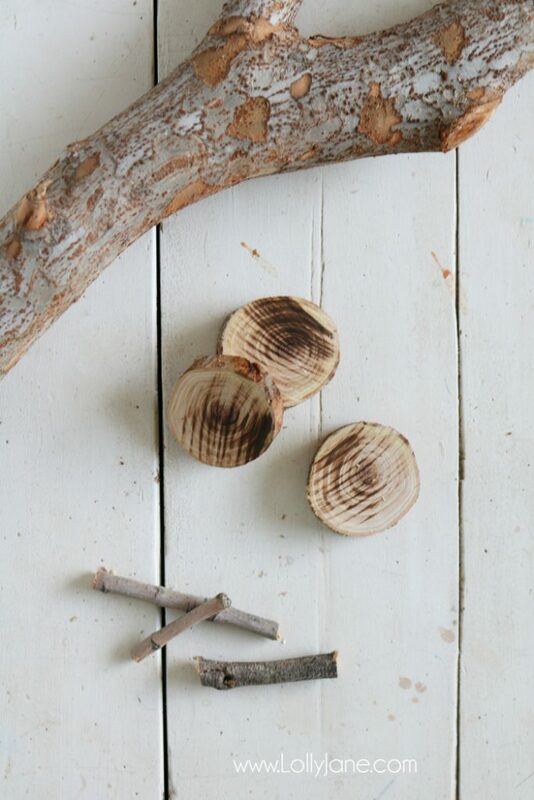 I snagged some sticks from my own yard for the “dowel” to attach the wood slice base to the tree itself. 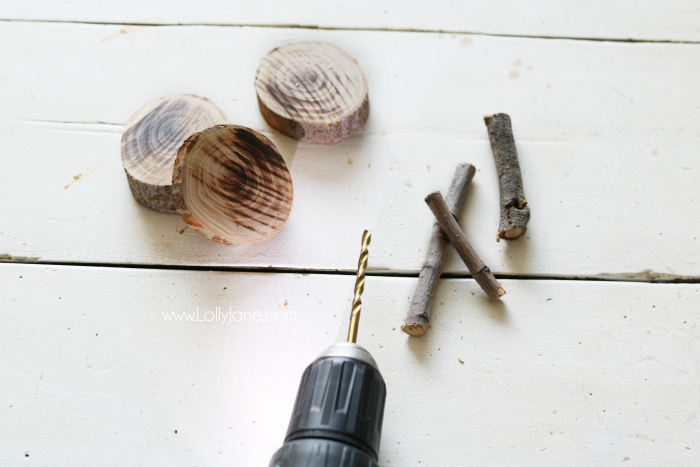 To attach it securely, I drilled some holes in the center of the mini wood slices. I then hot glued the sticks into the hole for extra security. 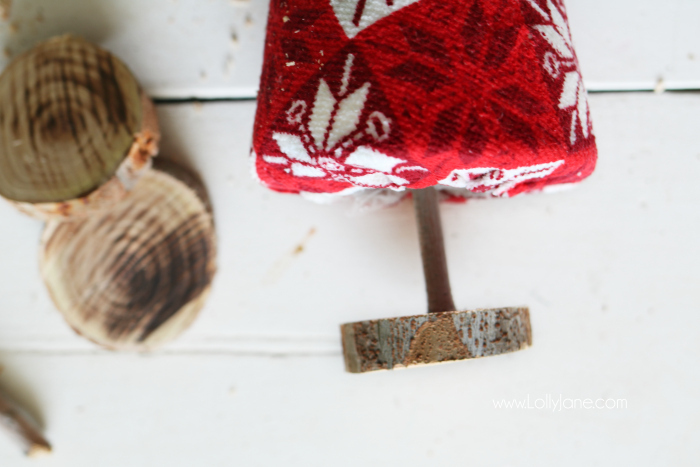 Then I pushed the branch through the tree base to complete the wood slice stand. I just love the colorful fabric against the natural elements! They turned out pretty darn cute, right? The total for all 3 trees was under $10. Not too shabby! These would be great for table centerpieces too. 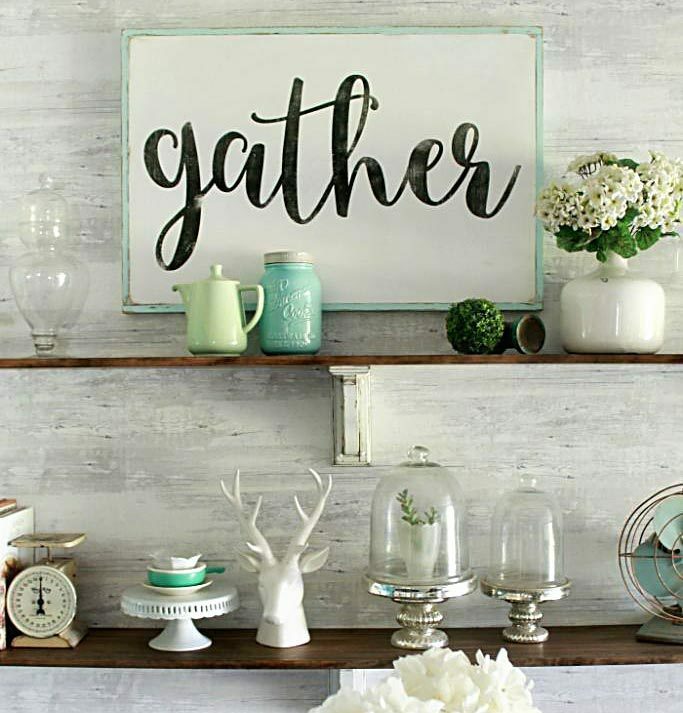 Such easy and inexpensive party decor to line a table in dozens of different sizes and patterns! 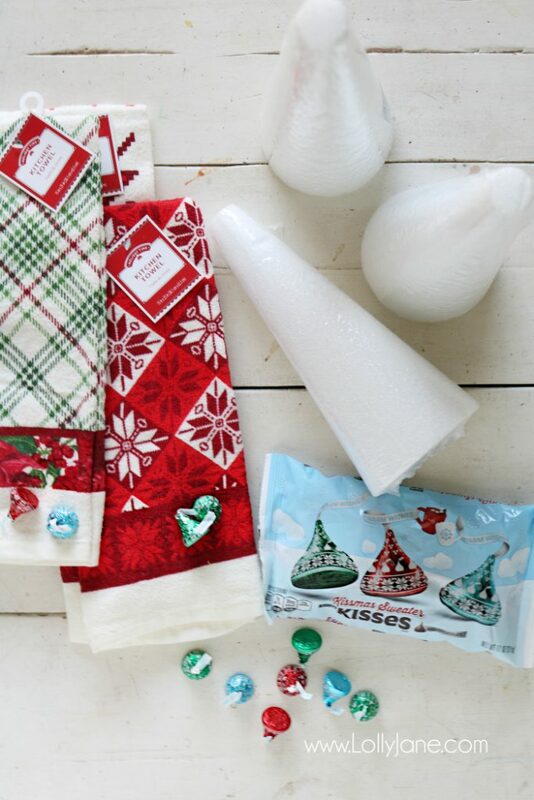 Adding some yummy Hershey’s Kisses Milk Chocolates sweeten the table! The Hershey Company is constantly creating ways to make the season more festive and we love the addition of their pretty foil wrappers. With its seasonal products exclusively sold at Walmart, they’re convenient to get your hands on and are must-haves for your holiday parties! 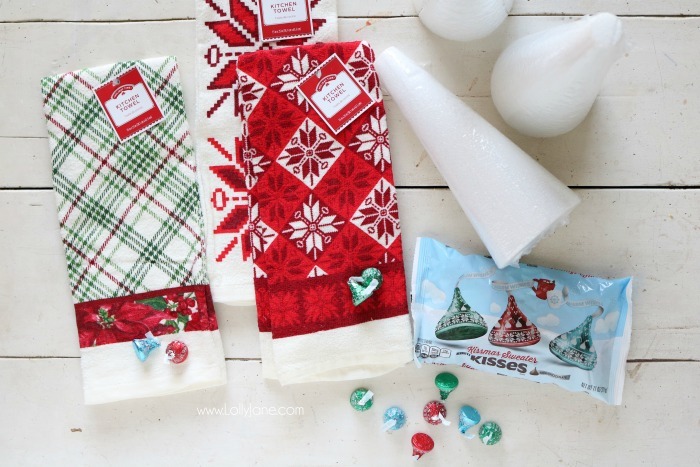 Big thanks to The Hershey Company for sponsoring today’s post! You never know where inspiration will come from and we love that they jumped on the Ugly Sweater trend! 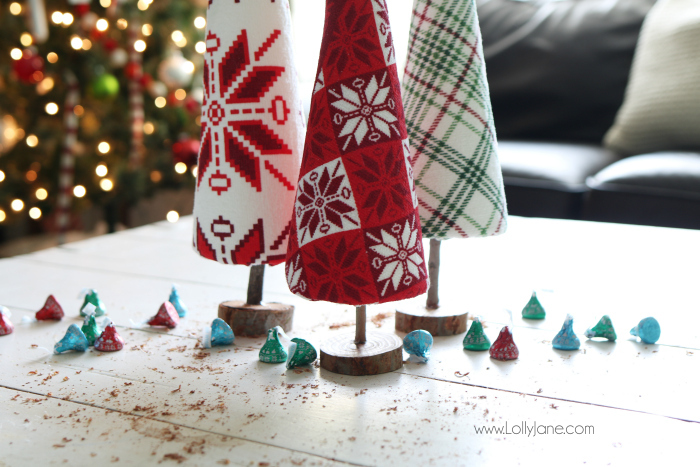 Celebrate with Hershey’s for more ways to spice up your holiday table! Well doggone it, sure hope our Walmart has some of those towels so can make few of these. 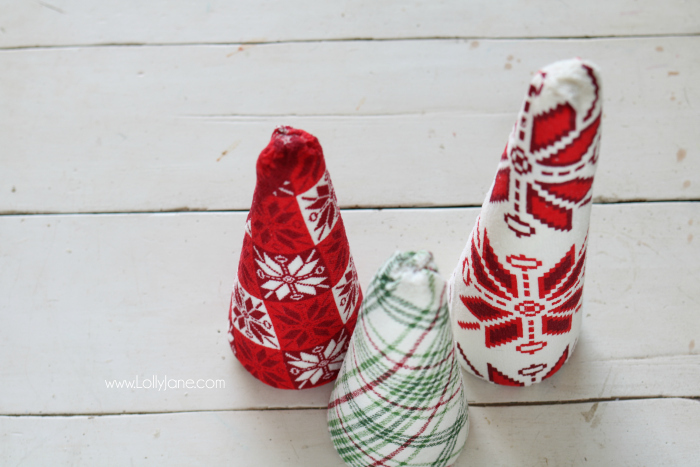 Would be great thrifty gifts to make. Your trees look so cute, love them. Love to have different styles, sizes of trees in arrangements on tables and my shutter shelf, gives wonderful personlity to arrangements. Have awesome weekend you two. These are so cute and I’d probably eat a half bag of those chocolates while making them. Thanks for sharing this at Celebrate Your Story! 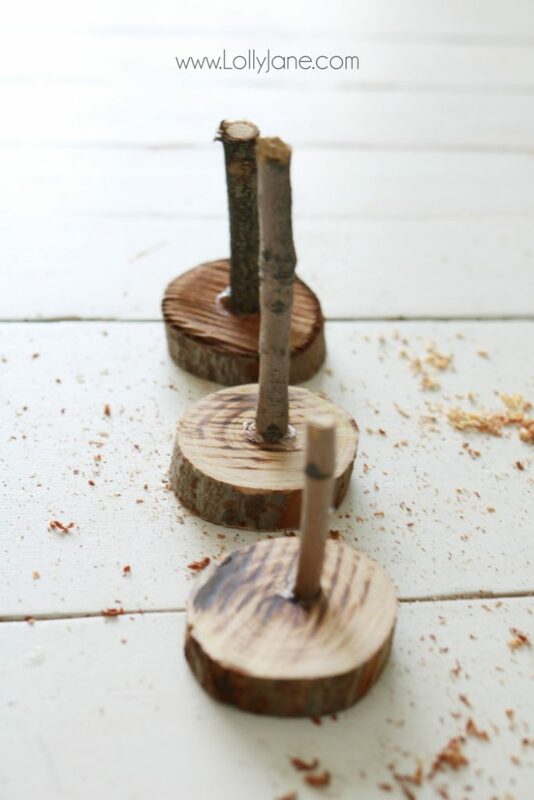 Your cute trees make a very effective table decoration, and they look fairly easy to make. Thanks so much, Pam! They were so fun to create! These are so cute! Thanks so much for sharing them. Nice try but you guys can’t make anything ugly even when you try! These are too cute and I’m featuring them when my party opens tonight. These are cute they look like they could fit into a Dr. Seuss book. Just a little off but oh so adorable. Hey, Kelli & Kristi! 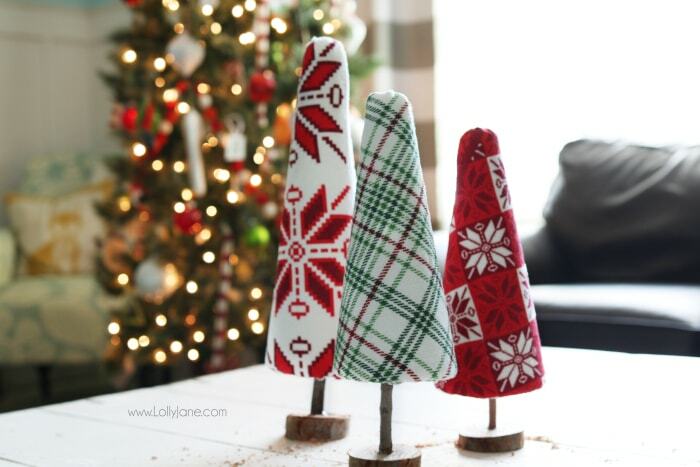 Just wanted to let you know that we loved your Ugly Christmas Sweater Trees Craft so much when you shared it at the #HomeMattersParty last week, we’ve FEATURED it THIS WEEK! Hope you can check it out when you get a sec. Happy Friday!! !